256MB RAM, 1ghz advised, instrument- effect- plugins. Buze is tickless and intuitive, it is compatible with a variety of plugin and file formats. A notable distinction of the Buze is its ableton-like envelope. You also have a number of workflow options including piano rolls, you can design custom pattern layouts, you have dynamic midi and audio routing and you can combine different pattern-resolutions. Like a standard DAW, you can use Buze for wave audio editing, midi controlling and more! You can utilize the multifaaceted Buze as a sampler, software synth, audio editor or sequencer. Buze sports a no non-sense interface. Its easy to learn and will help you increase your musical productivity. The best thing about Buze is that its free, and it supports a gazillion of free downloadable instrument/effects such as the plug-ins available here at Hitsquad.com. All you have to do is download it, run it, get machines, get samples, and enjoy your free portable software studio. *All plugins* can be switched between GUI or native buze-look, so you will not be distracted by massive GUI plugins. Wavetable can import WAV, MP3, FLAC, IFF and many more file formats. 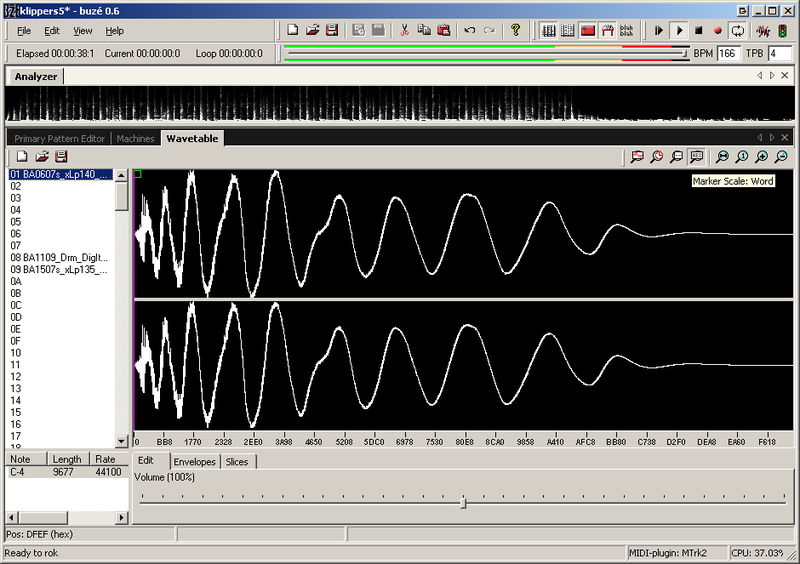 Features a basic wave editor.